Primary energy consumption grew by 2.2% in 2017, which sets oil to be the largest provider of future energy consumption. 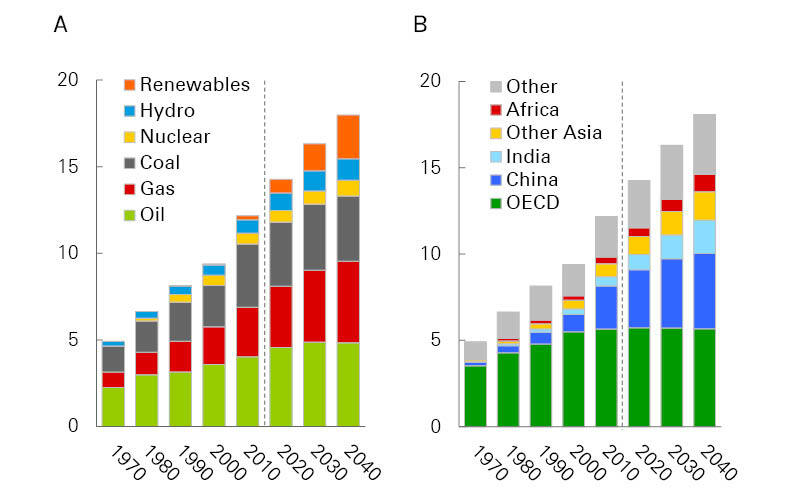 Primary energy demand (btoe) by (a) fuel and (b) region. Source: BP World Energy Outlook 2018. Primary energy consumption grew by 2.2% in 2017. That is the fastest growth rate since 2013, as BP observes in their recently published Statistical Review of World Energy 2018. Only a fraction of that growth was covered by new renewables (wind and solar), despite renewable power growing by a stunning 17%: ‘the largest ever contribution in terms of overall power generation’. Wind provided more than half of the growth in renewables, while solar contributed more than a third, the big driver being ‘the falls we have seen in solar costs’, according to BP. This rise in primary energy consumption means that oil consumption also grew last year: 1.7 MMbopd higher in 2017 than the year before, totalling 92.6 MMbopd. China, with an additional 500,000 bopd, was the largest contributor to this increase. US tight oil also grew rapidly, increasing by 1.5 MMbopd from the end of 2016 through to the spring of this year. The biggest spender was, as expected, the US with 19.9 MMbopd. For oil companies that still actually explore for oil, it must be good to learn from Equinor’s recently released Energy Perspectives 2018 that the company estimates the need for oil will grow substantially over the next 35 years. According to their Reform scenario, the world will need some 111 MMbopd in 2030 and 105 MMbopd in 2050 – meaning that, if we trust these figures, we will reach ‘peak demand’ in the foreseeable future. Equinor has arrived at approximately the same conclusion for gas. Demand will be higher in 2030 than in 2015 (the reference year), and even higher in 2050. In 2015 Equinor (then known as Statoil) concluded in their Energy Perspectives 2016 that ‘oil is here to stay’. As evident from the above, this statement is still true, at least for another 30 or more years, and we can comfortably add that the same is true for gas. Equinor, however, emphasizes that large investments are needed in the oil industry, as half of the required volumes will be sourced from existing fields. The million-dollar question is, of course, where all that oil will come from and where the investments will take place, as the oil companies seem to find less oil every year. In conclusion: there is a necessity (1) for continued exploration on a global scale to find additional resources; (2) to convert resources into reserves; and (3) to improve recovery from existing fields and thereby prolong tail-end production. Petroleum geologists and geophysicists will be busy for at least another two generations. Is it time to learn from the past?